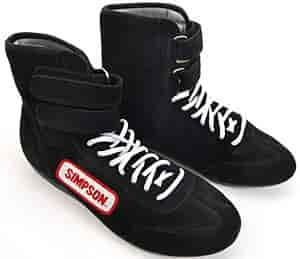 The Simpson High-Top Driving Shoe aids driver performance with top-of-the-line features: satin suede struck-through leather upper, Speedfit ankle closure, seven hole lace-up, heel support with shoehorn tab, padded ankle, and super-soft self-centering padded tongue. The fleece Nomex lining with flat seams and athletic insert are staples that separate Simpson quality and detail from the rest. This shoe also has satin suede leather toe, lace, and heel guard reinforcements for durability and Type R polyurethane soles with posi-grip pattern for complete traction. Note: Sizes shown are for men. Ladies should order 1.5 sizes down from your typical size to adjust.